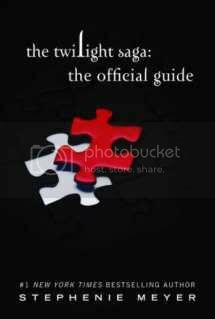 The Twilight Saga: The Official Illustrated Guide is the only authorized guide to the Twilight series. Please feel free to discuss your thoughts on this book in the comments section below! Haven’t purchased it yet but already KNOW I will have a great weekend when I have a copy and some cappuccino curled up on my sofa with the phone off. Nothing beats that feeling when your enjoying a good book. Yeah! So far I’m enjoying a lot of the backstories, tho parts of it can be very repetitive when it’s explaining different relationships, like between the Denali, it basically says the same thing for each of them, could have been trimmed. Some new stuff but not a lot new that a Diehard Twi-hard doesn’t already know. STILL LOVE IT THO! Love the fan art and covers from around the world. Other than our very own US version, I love Indonesia’s the most. Also, O.M.E — did anyone else notice on the jacket cover in the back Edward will be on the cover of the Graphic Novel Vol 2!! Love how that was just slipped in there–quiet as a mouse. Loved the images of Carlisle and Esme. Esme looks exactly as described in the book. Esme looks exactly as described in the book. Just kind and impossible not to love. I love how Steph explains why/how the birth scene came about. The fact that childbirth is still such a dangerous enterprise for women–that you could easily die giving birth especially if you have no access to proper medical care–that was a good reminder. It’s just a good companion to other twilight books. I just bought and read the book within 2 days. I have been waiting since 2008 for this book when Stephenie announced she would be working on it. From the authors interviews throughout the years I thought it would be a compilation of all that she revealed, in different mediums, about the characters but that wasn’t included in the four original books. I also thought that it would be written from an omniscient narrator perspective where all that remained as a question in the books would be answered since it does provide geneologies on the characters and family trees. While we did find out much about each characters history, there were huge questions left unanswered (like who is Embry Call’s father???). I thought that questions like these would be answered and that got me a little down. There was some repetition within the descriptions of coven relationships when characters were in the same coven. Despite all this, it was an okay buy. I don’t think that for the information it contained that it was worth $25 and there were a great many things contained in the book which I’d already learned from twilight fan sites throughout the years but there were a few tidbits that made the book worth while, like some of the characters motivations and thought processes. All in all, Stephenie is always a great writer, it is always enjoyable to read what she puts out as far as method and content and I would recommend it. I agree i have no clue what it is about but if its by Meyer count on it being good! Log in | 52 queries. 1.131 seconds.